U.S. envoy George Mitchell was in Israel on Thursday for his first visit since right-wing politician Benjamin Netanyahu became prime minister. It is Mitchell’s third visit to the region since President Obama appointed him as special envoy for Middle East peace. Mitchell plans to meet with Netanyahu and other Israeli politicians Thursday, as well as Palestinian leaders — including President Mahmoud Abbas — in the West Bank and Jerusalem on Friday. The former senator and seasoned diplomat has not been shy in articulating the U.S. desire to see a two-state solution to the Israeli-Palestinian conflict, which has led to speculation that the new Israeli government and the Obama administration may find themselves on a collision course. Netanyahu has indicated he wants serious negotiations with the Palestinians to continue, but he has not explicitly stated his support for Palestinian statehood. 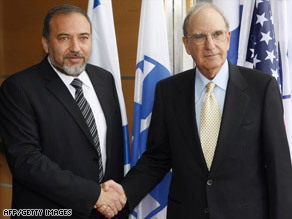 Questions about the new Israeli government’s commitment to a negotiated peace process came up when the new foreign minister, nationalist politician Avigdor Lieberman, declared the Annapolis process “null and void.” The Annapolis process, launched by the Bush administration in 2007, paved the way for the resumption of Israeli and Palestinian talks after they stopped earlier in the decade. After meeting Lieberman on Thursday morning, Mitchell said he had reiterated the U.S. stance. “U.S. policy favors, with respect to the Israeli-Palestinian conflict, a two-state solution which would have a Palestinian state living in peace alongside the Jewish state of Israel,” Mitchell said. “We look forward also to efforts to achieve a comprehensive peace throughout the region.” Lieberman said the two men had a “great opportunity to exchange some ideas” and spoke about close cooperation. “We spoke to coordinate our position regarding the Palestinian issue, regarding the area problems,” he said. “We are looking forward to the next meeting for some really deep dialogue about security, about economy, about all problems in the entire region.” The Israeli foreign minister said Israel will do everything necessary to improve the Palestinians’ economic situation. But in a statement after his meeting with Mitchell, he emphasized that Israel expects an “unequivocal commitment” from the international community to Israel’s security and to the Jewish state. Mitchell met Wednesday night with Defense Minister Ehud Barak, who told the U.S. envoy that the countries’ bilateral relationship is “deep and close.” “It is possible to reach cooperation and understanding on all issues that are on the table,” said Barak. The issue of Iran and its nuclear program was also a topic Thursday. After Mitchell met with Israeli President Shimon Peres, the president said he emphasized dialogue on the issue. “It is our common interest that dialogue with Iran will expose if there is an opportunity with Iran or is it all a hoax,” Peres said. “We all want a world that is clean of nuclear bombs, but the problem is that those holding the bombs are religious fanatics, extremists, that do not cringe from all methods of killing. “We need to create a wide international cooperation regarding the matter of Iran,” he said. “All this talk about a possible attack by Israel in Iran are not true. The solution to Iran is not a military solution.” Lieberman said the subject of Iran is a “major problem” for Israel and the whole region. “If you are looking for a stable solution to the Palestinian problem, before everything else you have [to] stop the intensification and the spreading of the Iranian threat,” Lieberman said in his statement.